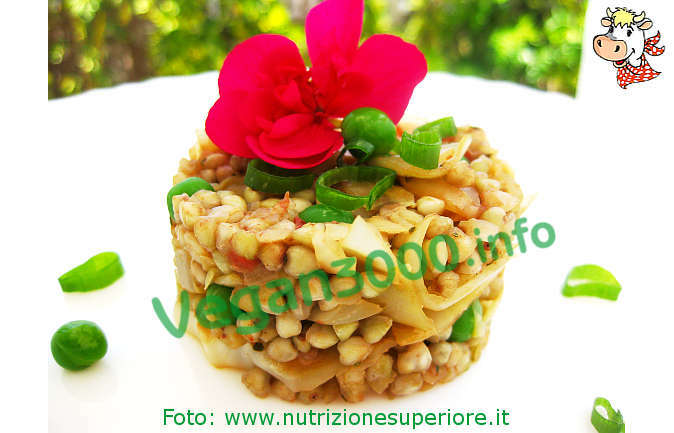 With this recipe we will explain how to prepare a vegan dish simple, yet very tasty (and with a very low caloric intake, which can be quite interesting if you want to be careful to line): buckwheat salad. The buckwheat is much healthier than the pasta and, at the same time, it is tastier. For this reason, we preferred to use it in this recipe. The amounts are calculated for preparing 4 servings, but you can safely use proportions to increase or decrease the ingredients to achieve the desired quantity. Take a pan with high sides and fill it with water. Wait until the water reaches the boiling point and add salt. You can then pour into pot buckwheat and wait for them to reach the ideal cooking (usually you have to cook it 15/20 minutes). In the meantime, take the cabbage and place it on a cutting board, cut into julienne. Afterward, take a pan and place it on the stove, adding a drizzle of olive oil. When the oil is heated, add the cabbage and toss in the Pan will be for about three minutes. Meanwhile, cut the tomatoes into small cubes as thin and add them in a pan, cover with a lid and reduce the heat. Leave to simmer the tomatoes and cabbage for about 15 minutes. Once cooked, drain it and add it once buckwheat into the pan containing the tomatoes and cabbage. Mix together, keeping the flame of shallow pan and add the peas. After a few minutes, turn off the heat and pour into a large bowl. Here you add the onion, salt and pepper according to your taste. And here, therefore, ready your salad vegan of buckwheat. You will see how the simplicity of this dish will surprise you with its authentic flavors, reminiscent of the popular cuisine of the past. We are sure that thanks to our recipe you won't have any difficulty in preparing this excellent first course and that you will be able to surprise your guests with this dish so tasty. There remains, therefore, to wish you a good preparation but, above all, Bon appétit!